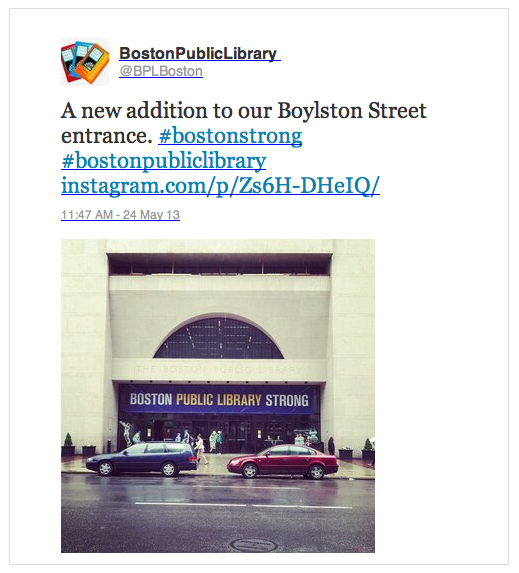 One year ago, longtime C&G Partners client The Boston Public Library were powerfully affected by the Boston bombing, with their main entrance directly across the street from the location of the blast. As a gesture of resilience afterwards, C&G Partners created a new banner spanning their main entrance with a play on the post-bombing slogan, "Boston Strong" that began appearing on t-shirts, buttons and signs throughout the city. The banner was set in blue, gold and white: the colors of the Boston Athletic Association, organizers of the Marathon. Still Boston (Public Library) Strong!